The first wave of democratization in the United States - the removal of property and taxpaying qualifications for the right to vote - was accompanied by the disenfranchisement of African American men, with the political actors most supportive of the former also the most insistent upon the latter. The United States is not unique in this respect: other canonical cases of democratization also saw simultaneous expansions and restrictions of political rights, yet this pattern has never been fully detailed or explained. 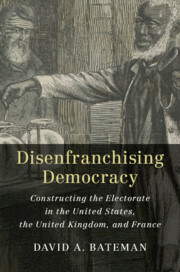 Through case studies of the USA, the UK, and France, Disenfranchising Democracy offers the first cross-national account of the relationship between democratization and disenfranchisement. It develops a political institutional perspective to explain their co-occurrence, focusing on the politics of coalition-building and the visions of political community coalitions advance in support of their goals. Bateman sheds new light on democratization, connecting it to the construction of citizenship and cultural identities.